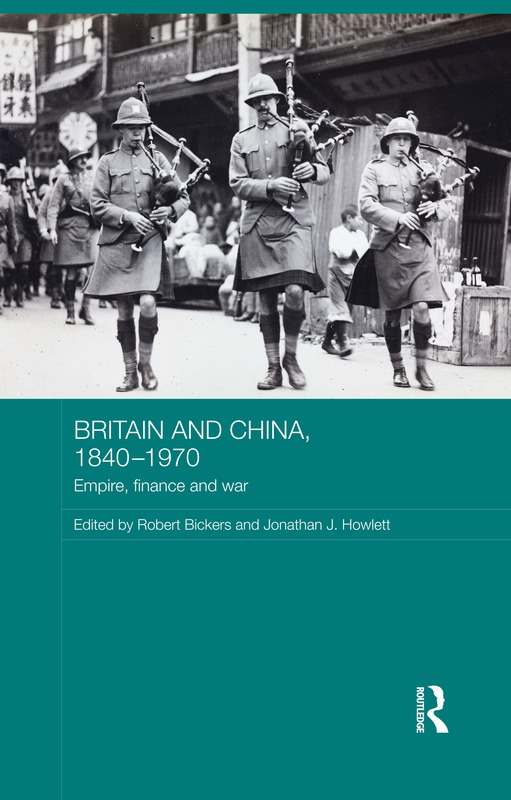 Just published by Routledge, and very much a BICC volume, Britain and China, 1840-1970: Empire, Finance and War, is co-edited by Robert Bickers and Jonathan J. Howlett. The volume presents some of the research first aired at BICC’s August 2011 conference ‘Britain and China, pasts, presents and futures’. Held at the University of Bristol this event brought together over 30 speakers from across the globe. The collection presents 11 essays, outlining the results of research into new archives, or exploring new paradigms for understanding the course of Britain-China relations. Contributors include BICC researcher Isabella Jackson, and essays by Paul Bailey, John Carroll, Chen Qianping, Koji Hirata, Sherman Xiaogang Lai, Benjamin Mountford, Stephen R. Platt and Hans van de Ven. The cover photograph shows the pipes of the Shanghai Scottish Company of the Shanghai Volunteer Corps in action on a Shanghai street in 1924: source, Hutchinson collection, Historical Photographs of China project (C) Barbara Merchant. Final preparations are underway in York for the New Perspectives on the Chinese 1950s Workshop, an international event bringing together experts from around the world to discuss new developments in this burgeoning area of historical research. The event follows a recent expansion in Asian History at the University of York (in Chinese, Japanese, Southeast and South Asian History) and is supported by the British Inter-University China Centre (AHRC) through the Chinese 1950s Network with additional support from the Department of History at the University of York. The initial CFP can be read here. The Chinese 1950s network explores new approaches China’s domestic and international history in this period, it is hosted at the University of York and partnered with East China Normal University (ECNU) in Shanghai. The aim of the workshop is to promote the sharing of ideas on historical issues and primary source work, to establishment of a network of researchers and to explore the potential for future collaborative work. Jennifer E. Altehenger (King’s College London), Finding the Right Words: Encyclopedic dictionaries, self-help guides, and the politics of knowledge in China, 1949-1956. Xiaobing Tang (University of Michigan), The Idea of Socialist Art in the 1950s. Christine Vidal (Université Lille III), From Beijing to Hangzhou: Song Yunbin and his experience of united front work (1949-1957). This workshop has been funded by the British Inter-University China Centre (AHRC) through the Chinese 1950s Network. The network explores new approaches China’s domestic and international history in this period, it is hosted at the University of York and partnered with East China Normal University (ECNU) in Shanghai. The aim of the workshop is to promote the sharing of ideas on historical issues and primary source work, the establishment of a network of researchers and to explore the potential for future collaborative work.